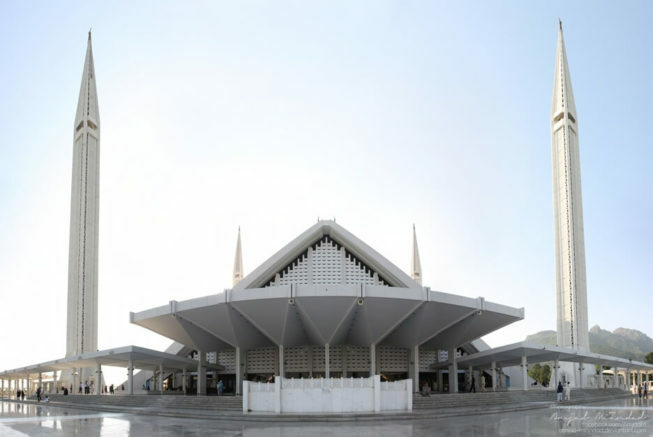 The impetus for the mosque began in 1966 when the late King Faisal bin Abdul-Aziz supported the initiative of the Pakistani Government to build a national mosque in Islamabad during an official visit to Pakistan. In 1969, an international competition was held in which architects from 17 countries submitted 43 proposals. The mosque was designed by Turkish architect Vedat Dalokay. Construction of the mosque began in 1976 by National Construction of Pakistan, led by Azim Khan and was funded by the government of Saudi Arabia, at a cost of over 130 million Saudi riyals (approximately 120 million USD today). King Faisal bin Abdul Aziz was instrumental in the funding, and both the mosque and the road leading to it were named after him after his assassination in 1975. The mosque was completed in 1986, and used to house the International Islamic University. Many conservative Muslims criticised the design at first for its unconventional design and lack of a traditional dome structure, but most criticism ended when the completed mosque’s scale, form, and setting against the Margalla Hills became evident. The Faisal Mosque is the work of Turkish architect Vedat Dalokay, who won the Aga Khan Award for Architecture for the project. The mosque’s architecture is modern and unique, lacking both the traditional domes and arches of most other mosques around the world. The mosque’s unusual design is a departure from the long history of South Asian Islamic architecture, fusing contemporary lines with the more traditional look of an Arab Bedouin’s tent, with its large triangular prayer hall and four minarets. However, unlike traditional masjid design, it lacks a dome. The minarets borrow their design from Turkish tradition and are thin and pencil like. “I tried to capture the spirit, proportion and geometry of Kaaba in a purely abstract manner. Imagine the apex of each of the four minaret as a scaled explosion of four highest corners of Kaaba – thus an unseen Kaaba form is bounded by the minarets at the four corners in a proportion of height to base. Shah Faisal Mosque akin to Kaaba. The Faisal Mosque has covered area of 5,000 m2 (54,000 sq ft). It can accommodate 10,000 worshipers in its main prayer hall, 24,000 in its porticoes, 40,000 in its courtyard, and another 200,000 in its adjoining grounds. Although its covered main prayer hall is smaller than that of the Hassan II Mosque in Casablanca (the world’s third largest mosque), Faisal Mosque has the third largest capacity of accommodating worshipers in its adjoining grounds after the Masjid al-Haram (Grand Mosque) of Mecca, the Al-Masjid al-Nabawi (Prophet’s Mosque) in Medina. Each of the Mosque’s four minarets are 80 m (260 ft) high (the tallest minarets in South Asia) and measure 10 x 10 m in circumference.